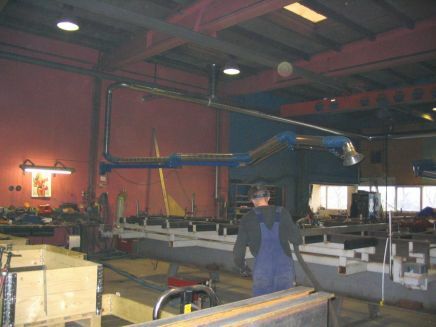 In 2009, Gantech needed a new ventilation system for their new 2,000 m2 production area. Prima-vent A/S has delivered a sustainable solution that takes energy saving into account to a much larger degree. 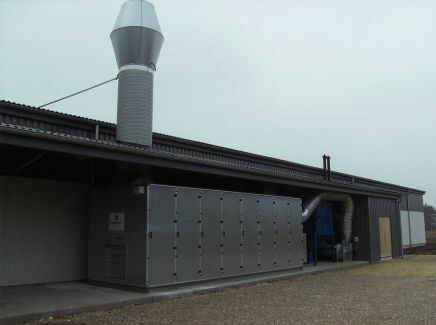 This solution involves air renewal up to 3 times an hour, up to 80% heat recovery from the aspirated air, and cleaning of the generated fumes. The system is fitted with special timers that turn the system on and off in accordance with customer needs. 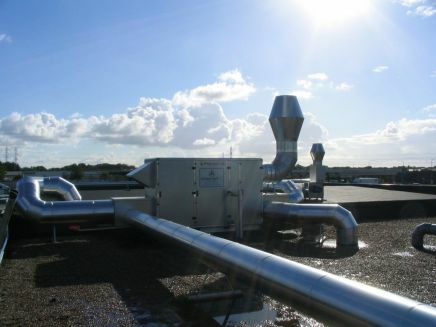 Prima-vent A/S offers turn-key solutions involving both small and large ventilation systems, and we guarantee the most professional service possible based on many years of experience. 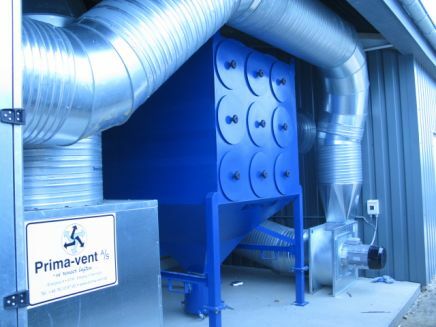 Please contact us to set up an appointment for a non-committal talk about your particular ventilation needs. The Prima-vent suction arms are designed to allow easy handling and provide an energy saving back pressure. The arm is fitted with gas shock absorbers, and it runs very easily. Several of the arm segments may be turned and flipped, thereby allowing a large work area to be covered. The tip of the arm is fitted with a flexible head that may be adjusted to fit the work area perfectly. 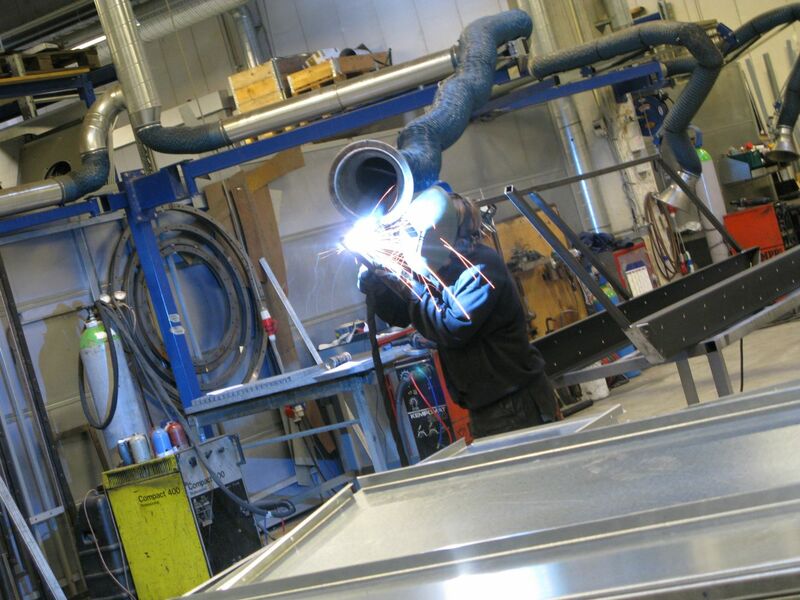 More than half of the energy consumption for welding aspiration is often utilised within the welding arm back pressure. Featuring external support arms and a trumpet-shaped head, which leads to the lowest possible level of pressure loss, the Prima-vent suction arm has been designed to provide the lowest possible back pressure. Often, pressure loss equals noise. Working with low pressure loss levels not only saves energy, it also reduces the noise level of the Prima-vent suction arm. The Prima-vent suction arm comes with a wall mount. As an alternative, however, the suction arm may also be installed on a pylon. Combi aggregate type CA x bv with a nominal capacity of 25,000 m3/h. For injection and heating of renewed air. Integrated heating surface, double cross and exhaust ventilator. Jumbo filter X22.5 at 15,000 m3/h for cleaning of welding fumes. 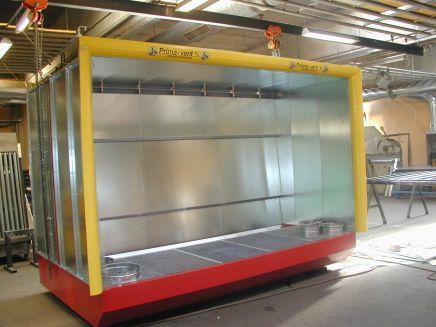 The Prima-vent central vacuuming system is used as a combined system for material transport and central vacuuming. 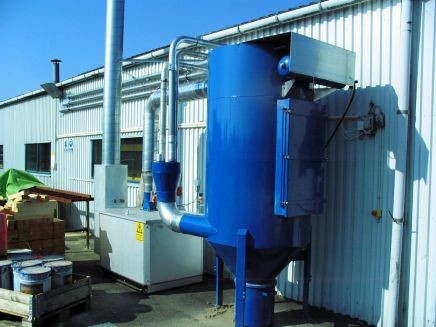 This integrated and highly effective vacuum system offers a range of flexible fields of application. It consists of a filter segment with dust / material separation features, a drive segment as well as a suction and pipe system. The filter system may be fitted with a pre-collector in accordance with the principle of drop chambers. The filtration takes place by means of a compact filter cartridge. The filter cartridge is automatically cleaned by means of compressed air. The dust from the filter segment may be moved to a dust drawer. Continuous sluice or a sluice with bigbag. .
Prima-vent central vacuum system is utilized as a combined system for material transport and central vacuum. The integrated highly efficient vacuum system provides many flexible application possibilities. 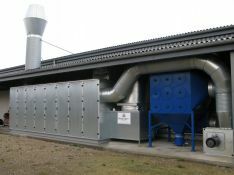 The system consists of a filter unit, a fan, and a piping system for each working area. Prima-vent provides complete solutions with included installation, but it is also possible for customers to install the system themselves with support from Prima-vent.